1. We will have two tables in DB to populate two dropdowns. First dropdown will be populated on load from first table. On change of value in First dropdown, second dropdown will be populated using the second table. 2. We will use ajax post using jQuery to fetch the data corresponding to value selected in first dropdown and the list will be appended to second dropdown. 3. We are going to use Entity Framework and database first approach as ORM. We will create our DB first and then will create out EF classes out of that. Add an .edmx file in your solution. Open the edmx, right click on it and click generate model from database. On clicking Update Model from Database, will generate our classes. This approach is called as Database First approach where in we create out database first and then create our model classes using database. The classes generated from Database. The CarModel holds the reference of CarCompany class. The relationship between the two is o or 1 to many. //Creating object of Service class Car. We have a separate service class to query to DB. //Creating object of ViewModel which will pass as model to the view. //Creating IEnumerable list of SelectedListItem. 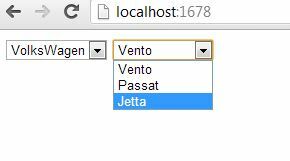 //Creating List of CarCompany object which will hold the list of CarCompany objects from DB. //We are iterating through the CarCompanyList and are using Company name and Id to create SelectedList. //Selected List is assigned to model's property. //View is returned with model as parameter. We have another action method which returns json result. When user selects some value in the dropdown. The dropdown value is posted to this method using ajax and jQuery as a parameter. The method based on the parameter queries the CarModel table i.e. second table and returns the list in json form. //Gets the Cars based on the company selected in first Dropdown. //Method accepts selectedValue as parameter. This is basically the selected value of first dropdown. //Created object of service class which holds the method that queries database. //Created a list of string to hold car names from Database. //Populating the list by calling GetCarsByCompanyId method of service class. //Returning the list using jSon. //Gets the CarCompany List from DB. //Created DataContext to query DB. //returns all the records present in CarCompany table in list format. //Gets the CarModel list based on CompanyId which is foreign key in Carmodel table. //returns all the records from table based on companyId in list format. This class holds two methods. The GetCompanyListFromDB() method fetches the CarCompany list from DB. The GetCarsByCompanyId() method fetched the CarModel List based on CarCompanyId supplied. //This object of this model is passed as parameter to view. //List to hold the company names which is passed as model property. //This list is used to populate the first dropdown. 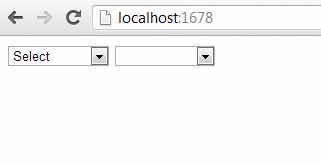 We have used DropDownListFor helper to render the first dropdwon. 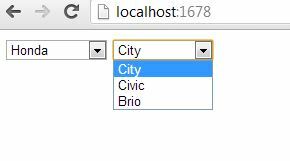 We have binded the dropdown to model property "listCarCompany". We have created second dropdown using select with id attribute as "Cars". When user will select value in First Dropdown, jQuery fetched the value of first dropdown. This value is posted as parameter to GetCarsBycompany method which returns the list of cars depending on the value passed. The json result is the binded to the second dropdown. 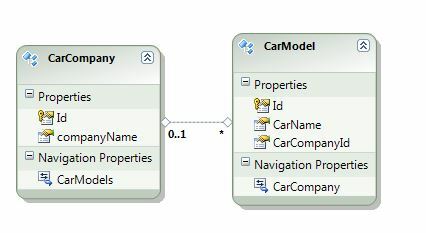 Create a new Folder under solution, name it as ViewModels and then create a class with name CarViewModel. OR you can check out the video link. is there anything else i have to add to this project which is not mentioned in this tuto, because i've done all the steps, and it doesn't work for me ? The above tutorial information is enough. What are you stuck ? can you explain in brief, or are you getting any error ? Send me your code at 20fingers2brains@gmail.com. Thank you very much for this post! The comments in the code were very helpful to understand what's going on. 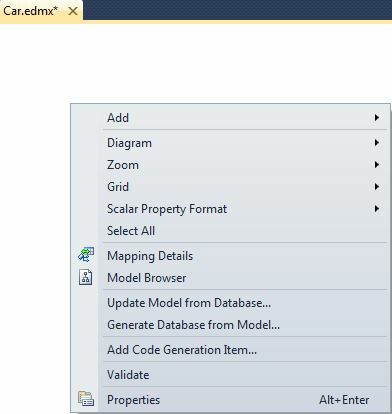 Even though this was written using MVC 3, it works with VS 2013, MVC 5 and EF 6 just fine. The only change I had to make was to add two lines in the view to load jQuery. Thank you for the article. This is very helpful. I was able to get this to work successfully, however I have one question. The second drop-down does properly change to the correct selection based on the first drop-down but when I go back and choose the word "Select" in the first drop-down, the second field maintains the previous list. It does not clear out. How can I clear the second drop-down field when I select the word "Select" again in the first drop-down field? Add a check inside change event call of first dropdown. and in the else part clear the dropdown. Nice article Thanks. This is rally cool .net article website.